Day 37: Get Out Before The Rain Starts! It was a great night in the hut. Sleeping in the same room as six other people is always a crap shoot, and this one worked out. Everyone was really sound sleepers, so it was a great night of sleep. I let myself go to bed early last night without writing and was up naturally at 4:30am and did it before we left. The weather forecast for today had a front coming up from the arctic that would bring rain and dropping temperatures. 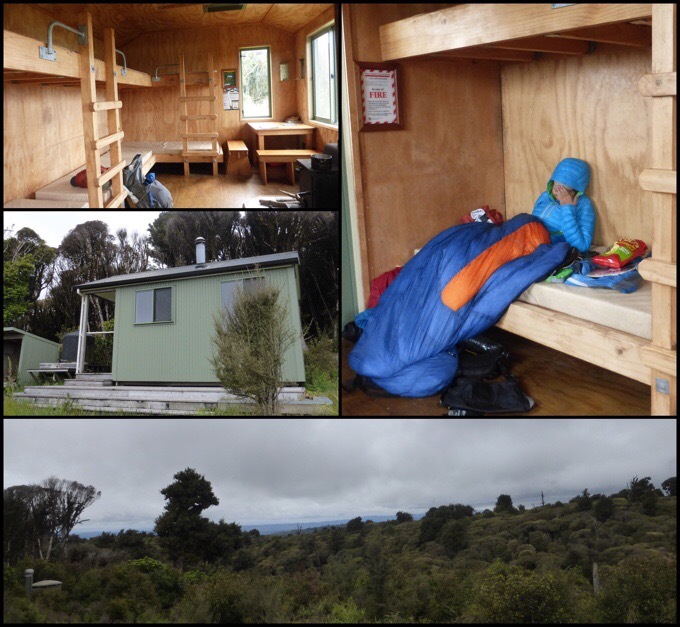 The Hauhungaroa Hut, with bunks for six people, was just 7mi/11km away, but it was supposedly a tough and time consuming stretch. At least three people were planning to do that stretch and say at the hut. We weren’t sure and decided to just hike and see what we felt like when we got there. We headed out at 7am. Our trail notes give a time estimate for each section, which we tend to be much faster than, but it gives us a good idea of the difficulty of what’s to come. 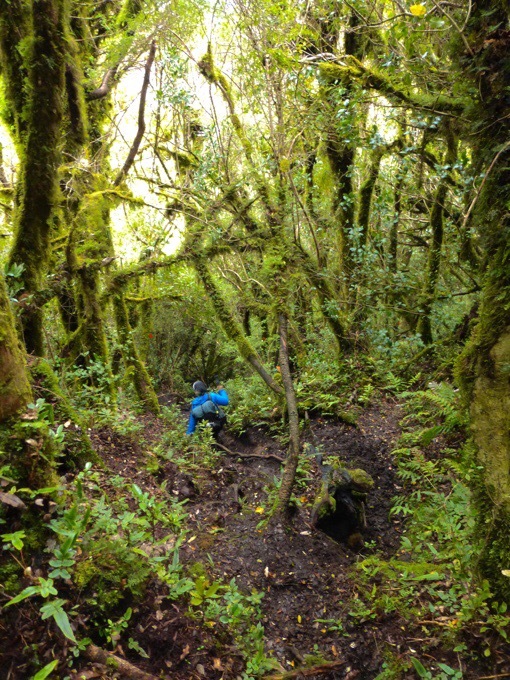 For the 7mi/11km along the Hauhungaroa Track to the hut, it was said to allow 7hrs. That meant it would surely be slow going. From using Why Not’s TA journal from last year, we knew it would be more like 5hrs. 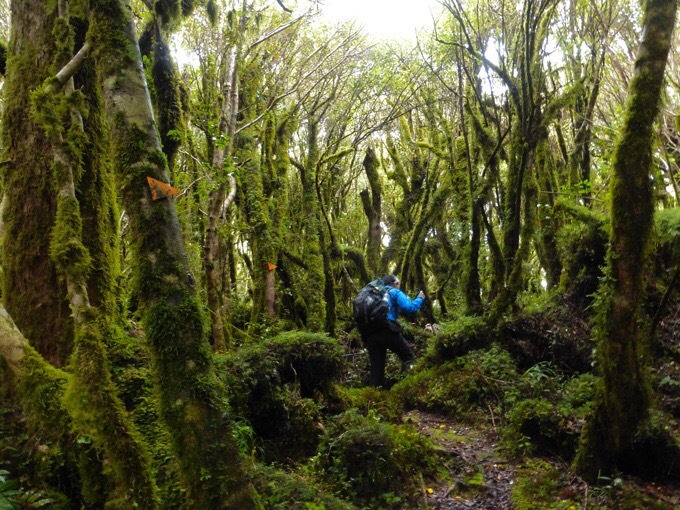 It was sticky and humid when we headed out, and the temps dropped as we got closer to the hut. The first half of the hike was smooth sailing, but the second half had more of those steep ups and downs that are slow going with a stream to go through at the bottom of each down. 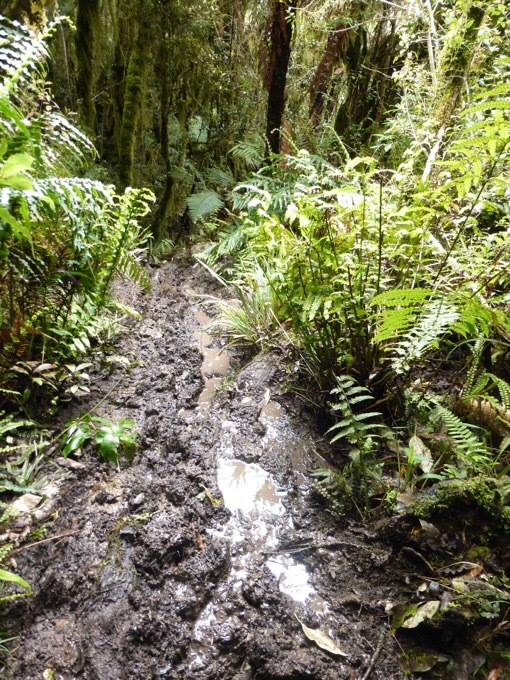 Some of the track was along the Waihaha River, so we were crossing many of the side streams that fed it. The cooler temps and wind were welcomed at the top of the climbs. Overall, it was less taxing than we anticipated, but plenty tiring. We ended up taking less than 4.5hrs and arrived at 11:20am. We looked up the weather to see that rain was in the forecast in the form of light rain fairly consistently from this afternoon through tomorrow morning. Since it was early, and it wasn’t raining yet, we decided that it would be nice to finish out the forest today and tent at the end of it another 5mi/10km after the hut. Since we knew that wouldn’t take very long, we took an extended break in the hut for 1hr 40mins. The wind had picked up as well, so it was great to have a place to be inside for lunch. While we were there, I decided to make macaroni and tuna for dinner since I had an extra dinner. It hit the spot. 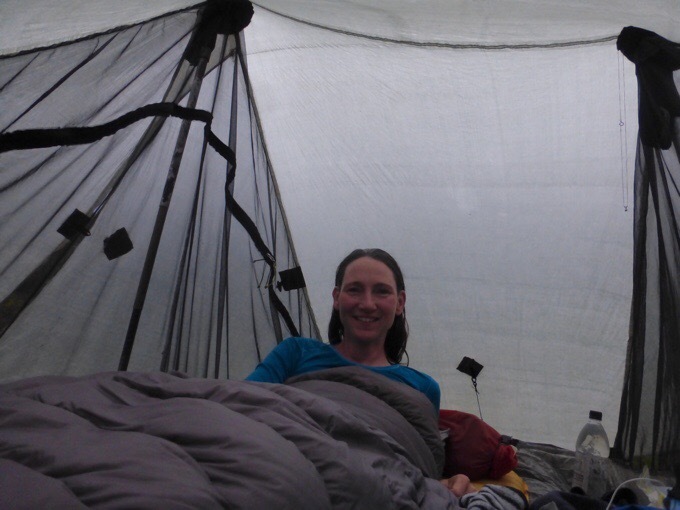 Becky was happy to bring out her sleeping bag and down jacket and huddle up in one of the beds for a break. She is dealing with a cold or allergies, but is a trooper! Like me, she isn’t a napper, but it was nice just to relax for a bit in the warm bag. We’ve done two long days in a row, and it was a much needed time to rest. Neither of us were interested in making today a big day. While we were there, the Swedish couple arrived and decided to stay. The hitching trio also had lunch at the hut and decided to hike out as well with the hopes of getting a ride to town on the remote road at the end of the track. 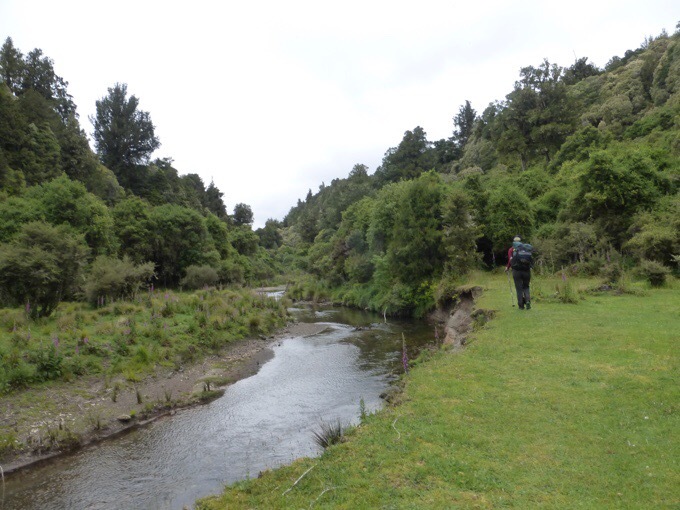 There is over 19mi/30km of road walking (I think much of it on an old 4WD road) into the next town of Taurmarunui. 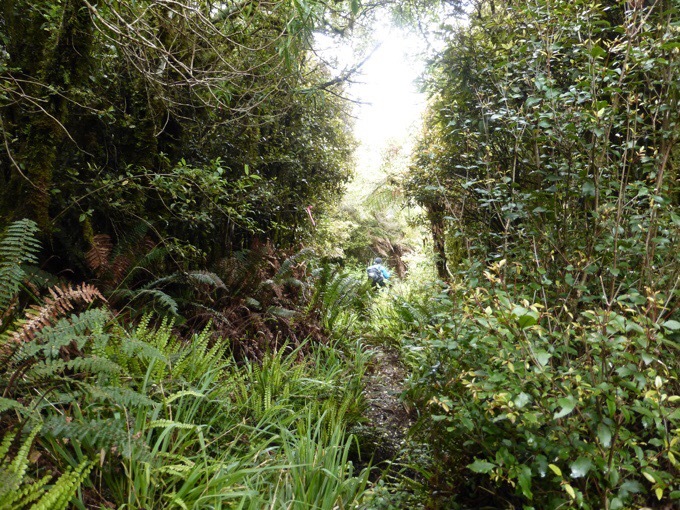 It took us 2.5hrs to get through the remaining 4mi/6.5km of the Hauhungaroa Track. It went downhill quite a bit and had plenty of the foot sucking mud that was unavoidable. About 20mins before we reached the end of the track, the rain started to fall. We got to our destination at 3:20pm and were happy to call it a day. We set up the tents in light rain, and it rained harder and more steadily for the next 6hrs until 9:15pm. It has stopped for now, and may be gone for good. It is still blustery, but the clouds have cleared a bit. The moon is so bright that I don’t need my headlamp in my tent. Good thing we got out of that mudslide of a trail before the rain. It will be much worse tomorrow. Both our tents worked out great and I’m oh so happy in my home. This is the most alone time I’ve had in over a month! It seems the Tarptent Contrail is doing just fine. I was worried it needed to be seam sealed because it was dripping on Becky a few nights ago when it rained. I have a theory now on what that was because I noticed it on mine two nights ago. If there is a really high tree above the tent, larger drops can fall down on the tent and cause the inner condensation to spray down on you. That may have been what was happening the other night in the Contrail. I can say that Becky’s old tent was like a bivy in size, and she likes that she can sit up fully in the Contrail and pack and unpack everything inside the tent. We both also were able to cook from our tents tonight and that was essential with how steady and blowing the rain was. 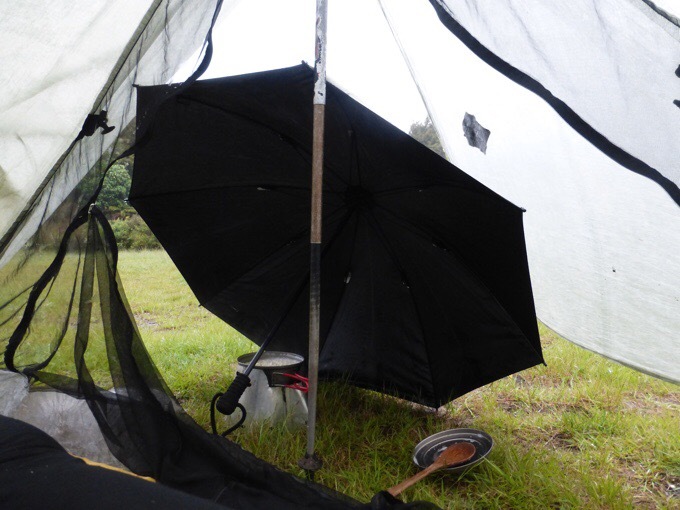 Another great use for the umbrella!It totally protected me from the blowing rain while I cooked. You’d think we’d be bored, but I think we both were drained by the last few days and ready to crash. I fell asleep for at least 40mins not long after setting up the tents and am now wide awake at 9:30pm, of course. Becky wasn’t feeling well today with a combo of the back to back long days, a cold, and a headache, so the time to sleep was perfect timing for her as well. The cool temps made it feel like fall so I’m huddled in my sleeping bag and the light rain just lulls me in and out of sleep. We only did 18.5km/11.5mi of hiking today, but it was 7hrs of hard work after two days in a row of over 10hrs of hiking. I’m happy to get the rest! I watched an episode of Bloodline (just starting season 2). I so badly wish I had the last few Survivor episodes offline. I can stream them in town, but don’t have them offline to watch on trail. I will watch them eventually! I’m not a huge fan of the darkness of Bloodline, but it’s all I have on my phone offline. This was also perfect timing because the next two legs of the TA are logistically more complicated and I hadn’t had time to really delve into the planning. 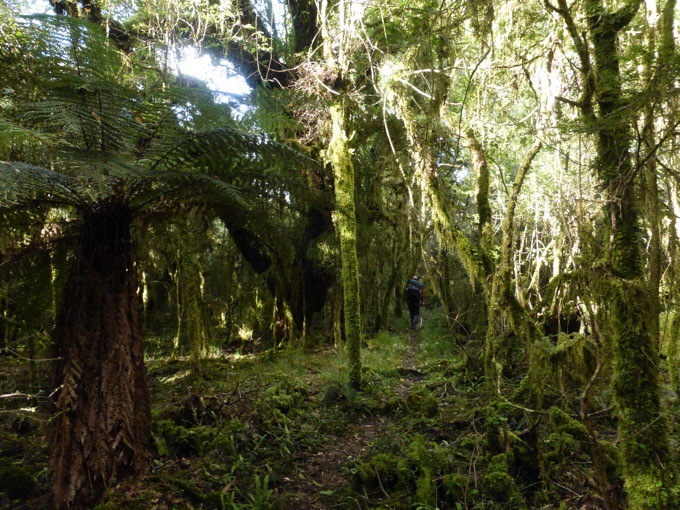 This coming leg is the Tongariro Crossing, which is part of one of the Great Walks. The leg after that is the Whanganui River kayak/canoe section. I’ll talk more about them once we figure it all out, but I feel much better now that I’ve read over all of it in detail and understand it better. It took me over and hour to understand it all and get the distances figured out. So glad to have that done before we reach Taumarunui tomorrow. I hope to make some calls on the walk into town tomorrow to iron out some of the logistics. One interesting side note, for the first time since meeting Becky 31 days ago, we are camped somewhere with just to two of us. Crazy to think this trail is that congested! Well, it’s actually the way it’s designed more than anything. 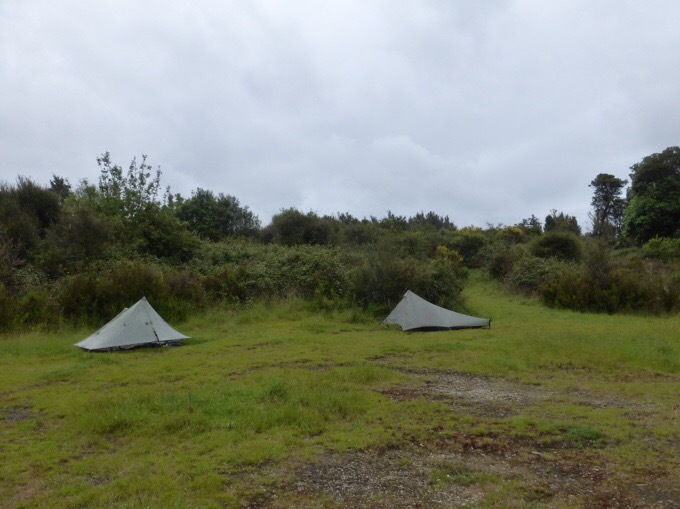 If you are camping legally, there are limited places to camp because there is so much private land. 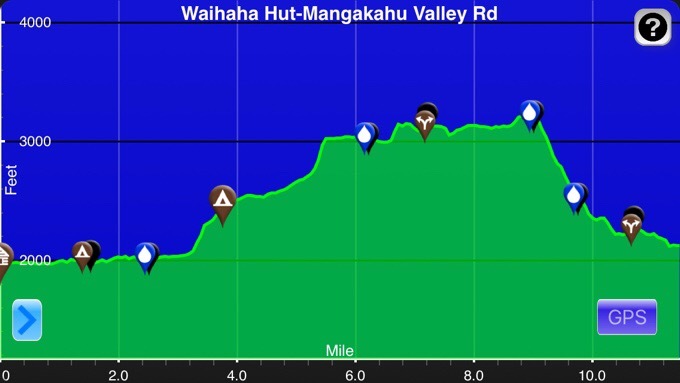 That tends to funnel us into limited choices where other hikers will most likely be. 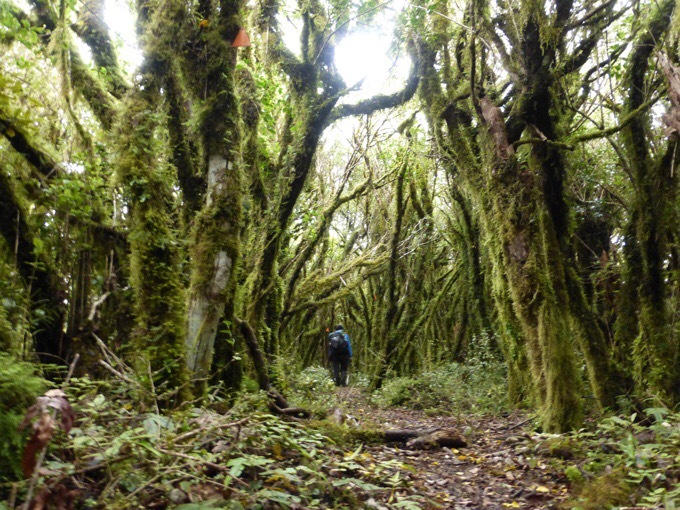 Yes, you will meet TA hikers that say they are solo “freedom camping” (camping outside a formal campground) every night, and that is possible to camp alone, but it’s not necessarily done so legally. Just an interesting aspect to this trail worth noting. Whew, long post, I guess I shouldn’t have napped! Goodnight. 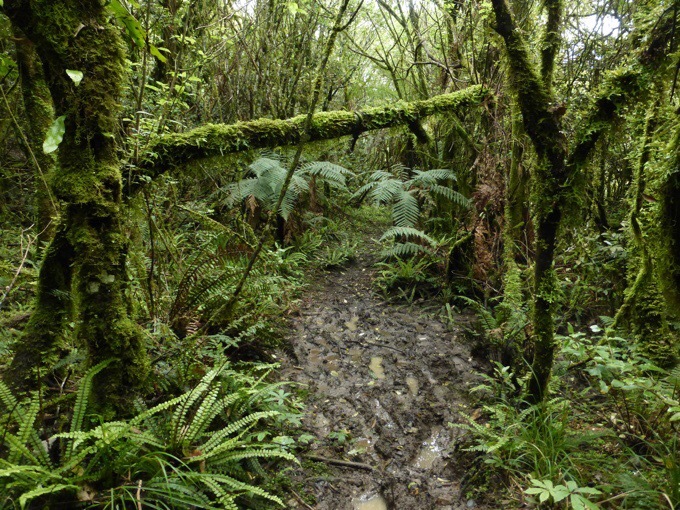 Hi Erin, I’ve wondering why you never mention leeches in all that wet bush country so googled “leeches” “NZ”……….they don’t have any that actually feed of human beings. 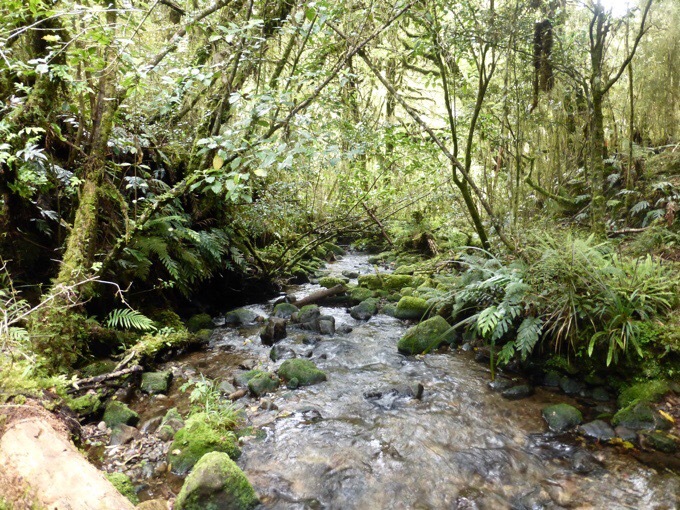 Those Kiwi’s are so spoiled 😉 ….. No snakes, no leeches and one rare harmful spider. If you were here in Victoria, Australia you would have plenty of all by now and had to possibly remove scores of leeches from various places 🙂 . It looks the walking is getting better and better. 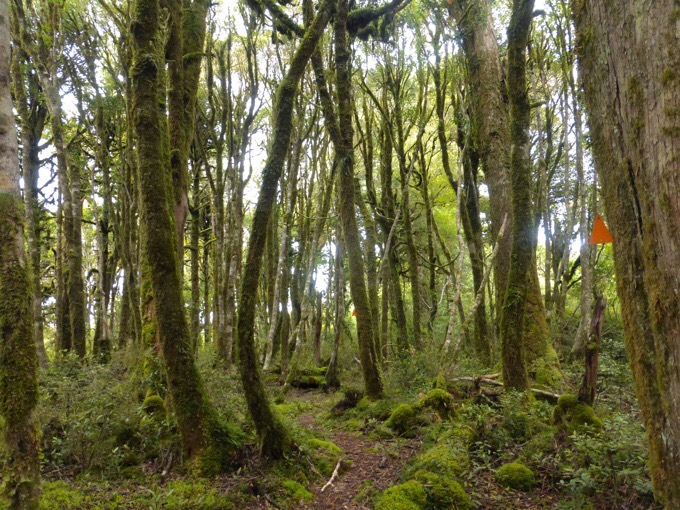 It’s beautiful country…just wait till the south island. Oh the anticipation is for sure building and big stuff the next two weeks. Yes, my theory is that they are so unchallenged by deadly animals that they need to make the trails more difficult. Yes, the anticipation is building! Great advice! It does seem that we are setting off at Whakahoro, but probably paddling all the way into Whanganui. We are mostly going with canoes and may have an odd number and will rotate the one kayak for fun. Blazing Paddles did tell us that Yeti Tours is where many seem to go and that they give a good deal if you aren’t in a small group too. We were advised against all kayaks with the big barrels we’ll have. Alright, a camping spot to yourselves. That’s so rad. Hope it was a real rest and felt backcountry-ish. Hope Becky gets over what ever it is that is ailing her. It’s on the upswing for sure! I hope Becky is feeling better.